Sometimes starting a new collection can be intimidating simply because of the number of different items that are available. Most collectibles can be collected by some kind of theme within the collectible space - baseball cards can be collected by team or year, rocks can be collected by color or type, toy cars can be collected by manufacturer or type of vehicle - and world coins are no exception. Because of the large variety of coins that exist, it's easy to pick one (or more) themes to collect instead of trying to collect anything and everything. A themed collection can also be more interesting to display, because the coins are connected to each other. Children especially may enjoy building a themed collection because it's easier to know what to look for. A collection based around the pictures on the coins requires no reading and allows the collector to make decisions about whether to include or exclude a certain coin. Some good picture themes are animals, plants, people, buildings, or transportation (boats, cars, airplanes, etc.). You can narrow down the theme even further (only birds, only flowers, only boats) but I think you'll find this will seriously limit the size of your collection. Still, for a child's collection, or a collection for a very specific purpose (to frame and hang in a boat, for example), a very small, very specific theme can be a great way to start. For a collection with personal significance, you could collect only coins from a certain year (your birth, child's birth, wedding, etc.). The coins in a collection like this would be quite varied, and the number of coins available to collect would be larger than with a picture theme. Beyond collecting based what's on the coins themselves, you can form a collection based on the physical properties of the coins. For a visually striking collection, you can collect coins that aren't round. I believe that non-round coins are less common now than they have been over the past 50 years, but you can find square coins, octagonal (and other multi-sided) coins, and scalloped coins (with a wavy edge). Several countries over the last 50 years have produced coins with holes, including Spain and Denmark. Japan's 5-yen coin has had with a hole in the center for many years (it's the only coin I can think of that is still in circulation). Between 1900 and 1950, more countries had coins with holes (including Belgium and France). You can also create a collection around the color of the coins. A large percentage of all coins are silver in color (though very few are made of actual silver), so it can be fun to collect only the other colors - copper or bronze (brownish) or gold-colored (you're very unlikely to find any coins made of actual gold). Older coins that look black are probably made of zinc, which looks silvery when it's fresh but can tarnish to black. Because coins come from specific areas of the world, you can build a collection based on where the coins are from. They could be based on specific countries (coins from countries you've visited; coins from where your family comes from) or specific continents (Europe, Asia, Africa, South America) if you have a particular affinity for some part of the world. For children, it can be fun to try to collect one coin from every country. You can have a map of the world that can either be colored in or marked with pins as each country is collected, which can also help get children introduced to world geography. Even if you start with a theme, you eventually may expand your collection and start trying to collect every different world coin. The question then becomes - what constitutes a "different" coin? As a collector, you will have to make decisions about what kinds of changes you care about collecting and which you will pass up. While major changes (coin size, color, or picture) more obviously deserve to be in your collection, there are some less-obvious changes that you may or may not want to include. Mint marks - Some countries (including the US) put a different letter or symbol on coins to indicate where they were made. Except for the mint mark, the coins are usually identical. Language differences - Pre-Euro Belgium coins came in 2 varieties each year - one with Belgium written in Flemish (Belgie) and one with Belgium written in French (Belgique). The rest of the coins are identical. Font changes - From one year to another, the font (letter or number style) used to write on the coin may change, even if the rest of the coin (picture, denomination, etc.) is the same. This can be hard to spot unless you compare 2 coins side-by-side, or use a reference guide that mentions these changes. Minor design changes - Sometimes a coin's picture may undergo a slight change - made a little bigger, a little smaller, or simply re-done so that it is slightly different than it was before. These can be very hard to spot. Alignment changes - I noticed recently that Switzerland's coin alignment (see my earlier post about terminology) changed from coin to medal in the 1980s. Except for the alignment, the coin design (pictures and etc.) look the same. For these kinds of small changes, it is up to you to decide if it is worth having each variety in your collection or not (they very rarely affect the value of a coin). Coin collecting has its own lexicon that you'll find it helpful to become familiar with. These words help collectors accurately discuss coins. If you spend much time around other collectors, looking at coins, reading about coins, or even shopping for coins, you've probably run into a few of these. If you haven't, then learning about them ahead of time will prepare you for when they do come up. This is just a starting list; in future posts, I'll explain more coin vocabulary. 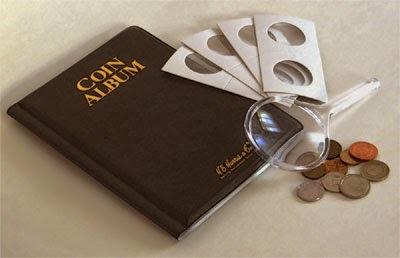 The collecting or study of money is called numismatics (pronounced "noo-miz-ma-ticks"). Coin collecting does not have its own word, so numismatics can mean someone who studies money, someone who collects currency (paper money), someone who collects tokens, someone who collects coins, etc. The most common meaning, however, is the collecting of money or money-like items (tokens, medals). In a library catalog, searching for "numismatics" is going to take you directly to money and coin related items. It's good to be familiar with this term so that if you see things like the "American Numismatic Association" or a magazine called "Numismatic News", you'll have a better idea what they are. Someone who collects or studies money is called a numismatist (pronounced "noo-miz-ma-tist"). If you've started your own world collection, you are now a numismatist. That sure sounds fancier than calling yourself a "coin collector". The parts of a coin are important to know for both describing coins and understanding what other people are saying about them. 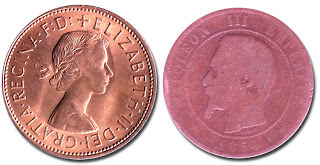 A coin has 2 sides, or faces. Most people just call these "front" and "back", or "heads" and "tails", but the correct terms are obverse (front/heads) and reverse (back/tails). 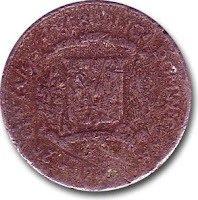 For most coins the obverse is the "heads" side - the side with a picture of a person, or animal, or coat-of-arms - and the reverse is the "tails" side. For coins that don't have an obvious obverse or reverse, I'm unsure how you pick which is the "front" and which is the "back". A coin also has an edge, which is the (usually) flat part that runs around the circumference of the coin. Sometimes the edge of a coin can be as distinctive as its obverse or reverse - keep an eye out for coins that have words, symbols, or a design on their edge (like the United States' Presidential $1 coins). A coin's alignment means how the obverse and reverse are lined up with each other. Each side of a coin has its own "up" direction, where the picture or writing is right-side up. Sometimes this "up" direction is the same on both sides, and sometimes it is opposite. Hold a coin so that one side is right-side up and flip it left-to-right (horizontally) to view the back. If the back is still right-side up, then the coin has medal alignment. If the back is now upside-down, then the coin has coin alignment (if you flip the coin top-to-bottom, or vertically, then the back appears right-side-up). On modern coins, any alignment besides these 2 is usually an error. If you have trouble remembering the difference between coin and medal alignment, think about a large medal hanging from a ribbon around someone's neck. To view the back, you would turn it side-to-side - and the back would still be still right-side up so you could read it. That's medal alignment. Picking the correct grade for a coin is subjective unless the grading is done by a professional. Wikipedia has a basic overview of the coin grading scale that may help you grade your own coins. You may occasionally see the word cull in association with coins. A cull coin is usually a coin that is so damaged as to be non-collectible. It may have nearly all the design worn off, it may have a large cut or gash, it may be missing part of the coin, or it may have one or more holes drilled into it (such as to hang it from a necklace). If you are shopping online, you generally don't want cull coins. A coin's composition is the metal (or metals) it is made of. Coins can be made out of many different metals - aluminum, bronze, stainless steel, zinc, copper, etc. - and are sometimes a mixture of 2 or more metals (such as United States pennies, which have a zinc core with a copper coating). Composition may be given in percentages ("92.5% silver, 7.5% copper" or ".9250 silver") or just the metal ("zinc-copper"). Sometimes the composition of a coin will change (due to changes in metal prices) from one year to the next, without the coin's design changing.